Atlantis Travel Agency has been 70 years in the traveller's service (since 1948) and it is one of the very few agencies in Greece that are members of IATA since 1951 (IATA # 27218424). Based on our long experience in the Greek market, we are very happy to offer our expertise and lowest prices for your cruises in Greece and travel services of the highest quality. If you wish, you can also just check about us at the Official Web Site of IATA. In the search box (where it states "Enter IATA Numeric Code or Verification Number") please insert our number 27218424 without spaces, click on "I am not a robot" and then click on "Validate". This official Web Site will verify in the bottom of the page that you are dealing with "ATLANTIS TRAVEL AGENCY - GREECE". Also children up to 12 years-old cruise FREE of charge! Explore all the cruises in Greece. Select from many Greek cruises. Choose from a selection of Greek island cruises. Reserve a cruise in Greece. Don't miss a Greek islands cruise. Receive our great discount on your Greek island cruise. View all our Greek islands cruises. Choose from many cruises in Greece and Turkey. Reserve your Greece cruises 2019. Select from our Greek cruises 2019. Book one of our cruises in Greece 2019. Have a look at our cruises in Greece 2019. Enjoy your Greece cruise in 2019. Take a Greek cruise in 2019. Select from our Greek island cruises 2019. View all our Greek islands cruises 2019. Choose a Greek islands cruise 2019. Live the magic of a Greek island cruise 2019. Thanks for putting together a wonderful cruise in Greece for us this past week. 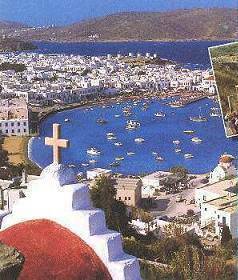 We took the 5 day/4 night Greek Island tour departing on October 22, 2012. The entire trip to the Greek Islands and Kusadasi (Ephesus) on the cruise ship Celestyal Crystal went off as planned from the; hotel reservation at the Radission Blu hotel -they had our reservation at the desk just as you set it up and to boot the hotel top floor had a great view of the Acropolis at night. The next day after breakfast the taxi was 15 minutes early and waiting to take us to the port. Also, the shore excursion packet that we booked was waiting for is to pick up on the the ship at the tour office. I think the taxi ride to the port was in some way one of the best recommendations since the port area is huge and the taxi driver took us to the exact spot for departing on the ship. As for our ship board experience the boat was excellent, not too big, excellent staff, good shows at night and when it came time to go on the various shore excursions they made sure you knew where to go (which deck), how to get the the bus and on what bus you were on for the different tours. I would certainly encourage anyone going to Greece for a tour to work with you and your agency. Again thanks so much, and once we are settled in look for our comment in trip advisor. Just a short note to thank you for and your team for the efficiency with which you managed our holiday in Greece last week. Everything went according to plan and we had a wonderful ten days both in Athens and on the cruise boat Celestyal Crystal. We could not fault the arrangements made by your agency, or the service we received both at the Park Hotel or on board the Celestyal Crystal. We are now back in Sri Lanka after a wonderful holiday in Greece. Every year we go on a family holiday and we all agree that this was one of the best holidays we have all had. The inland tour was tiring but we saw a lot and the guide and hotels were very good. The Cruise was excellent in every way and I am glad you encouraged us to have the Balcony Suite. Thank you very much for all your help and guidance when we were planning our holiday. We will have no hesitation to recommend you to our friends. Greece is a very popular destination for people living here. Zak, we had a fabulous time in Greece. Thanks for all your help. We are visiting again! Next time our stops have to include Mykonos and Santorini--so lovely. We also still want to visit Egypt when things get better and more stable over there. Again, thanks for all your help in planning our trip. My son and I should like to thank you very much for organizing our holiday in Greece so professionally. All the bookings for the hotel, the sight-seeing tours in Athens including Argolis and Delphi as well as the cruise-line ran smoothly without any problems. We enjoyed every minute of our time in Greece. The Louis Majesty is an outstanding cruise ship and the Louis Cruise Lines should be complimented on the good condition of the ship and the excellent service given by the crew. Needless to say we had the most memorable vacation and would thank you again for your suggestions and advice - they proved to be invaluable. We had a wonderful 10 days. Subject: Thank you...and thank you! My parents just returned from a wonderful Greek cruise aboard the Louis Majesty. They were absolutely delighted with the cruise, the private transfers you had provided and their Delphi day tour. They can't stop talking about it and were very happy!! You all worked so hard to make all this fall into place and i really appreciate that my parents enjoyed their experience so much! Needless to say, I will be sharing your details with other friends who are visiting your part of the world. In fact, I will be sending an email to a friend with your info and she hopes to plan a trip with you next month! Re: Jewels of the Aegean 5-days 4-nights cruise in Greece, departure of March 14th 2011. This is to thank you for a well-planned and well-delivered trip. The drivers were professional and always on time. The cruise and excursions were a success. I've arrived from my trip to Greece and Turkey, some days ago. Want to tell you that the cruise has been fantastic!!!.. The ship, the people aboard, all the services, and the excursions i took though your Agency!!! Hope I could go back to Greece!!! Thank you so much for be part of my dream!! I would like to take the opportunity, after this very amazing and memorable vacation to thank the whole team for your efforts. On behalf of everybody THANK YOU for a memorable trip.. I am writing to thank you for your excellent service and arrangement, that we have had a wonderful trip in Greece and islands. Everything happened in order as you described, and we felt very confident and safe to enjoy the trip. It is really a memorable experience. We have been home for over a week and I am very slow in sending this email to you but I do want to thank you very very much for all your help in planning the details of our trip to Athens! Everything went extremely well --all the transfers you arranged, the drivers were all very nice, kind, helpful and informative especially Petros and Elias. The Astor hotel was a perfect location for us and the view of the Acropolis was breathtaking. Our room for 4 was very spacious to my surprise! The only drawback was the handicap bathroom shower we had to use, but we managed. Our Greece cruise on the Easycruise liner went well. The ship was very clean and the staff and crew were great. All of our excursions were wonderful. Everything fell into place perfectly even when we called and added transfers at the last minute. I can't thank you enough. We will definitely be contacting you again in the future when we travel to Greece and you can be sure we will be highly recommending you to others planning their trips. My only regret is that we did not have time to stop by your office to thank all of you in person! Again a huge THANK YOU from the S and A families! We have returned from our dream vacation to Greece and what a wonderful time we had! I just wanted to thank you for your excellent and professional services. >From the minute we landed in Athens, everything was organized and most professional. And my complements to our driver, Mr. Stratulis who was ALWAYS waiting for us when we were to be picked up. He was very friendly and informative of the history of your beautiful country. Our total travel time from Hawaii to Athens was 25.50 hours. It was extremely long and tiring but all worth it. I hope this was not our last trip to Greece and if and when we do make the trip in the future, I will definitely be in touch with your agency. Your thoroughness and professionalism is to be commended. Except for only one other travel agent (who is my good friend) in the world, you are the best. You have done exceptionally well with the execution of our itinerary. There is so much that could go wrong on a twelve person excursion in a foreign country for 6 days. Nothing at all went wrong! The logisics worked out splendidly. My hat is off to you. Thank you for a most excellent performance from the beginning of our dialogue until we boarded the plane for home. It was a pleasure meeting you on our way to the airport after the wonderful Athens/Greek Island Cruise trip you organized for us! All that you and your staff did to make our 25th Anniversary trip spectacular is much appreciated! Everything was as you said it would be and very organized. We really did not need to do much thinking while there. Your suggestions of what to do and what not to do, restaurants to visit and transportation around town were all top-notch! The Astor Hotel was very convenient next the Plaka, the view of the Acropolis from our balcony was incredible! And thank you very much for organizing the 25 roses in both our hotel room and our ship cabin! As you know, my biggest concern was planning this trip from America with a travel agency in Athens using the Internet. Your website is very easy to use and the pricing is better than most places we checked. Working directly with you saved us hundreds of dollars we would have spent with a travel agency here in our hometown. Your relationship with all of the tour companies, cruise lines and hotels gives you a unique opportunity to provide a quality service for a great price! Please post this comment on your website so others do not have to wonder if "you are a real company" and that you really do work hard to help your clients around the world! My wife and I would like to thank for your services, our trip was magnificent and everything was arranged and went very smooth from picking us up from the airport to our last tour of Athens. Most of all we really enjoyed the 3 Day cruise of the Greek islands and of course our wonderful ship the Ocean Monarch with the excellent penthouse room that you offered last minute. We have been spreading the good news about Atlantis to our friends. I just wanted to express my thanks to you for an amazing cruise in Greece! My husband and I had a great time, everything was beautiful, and everything you arranged for us worked out perfectly. Should we have any friends who are planning to go to Greece, I will definitely recommend that they go through your travel agency. Just to say that my wife and I thoroughly enjoyed our 4 day cruise round the Greek Islands and our stay in Athens both before and after the cruise. The cruise was indeed very special and one that we enjoyed very much indeed. The excursions in Athens organised by Key Tours were first class and we particularly enjoyed the trip to Delphi, absolute magic. The President Hotel was very comfortable, the rooftop penthouse pool area is a real bonus. All the transfers were very efficiently carried out. My three children and I want to thank you so much for the wonderful vacation we enjoyed in Greece this year. We had the opportunity to see and experience a lot of Greece, thanks to the planning and assistance from you at Atlantis Travel. It is unfortunate that my husband had to work and miss this vacation. We have recommended your agency to others, including our travel agent here in Chicago. We have a friend in Italy who wants to visit and will send her your name as well. The tours you arranged leaving Athens to Argolis and Delphi worked perfectly. We enjoyed each tour without worrying about anything. For the tour to Argolis, the tour guide continued going back and forth between languages with such ease, it was if she was always telling us what we wanted to know as we passed by. She got off before our stop, so I never was able to thank her for her outstanding work. With the transfers you arranged, we just showed up downstairs at the hotel or outside the cruise ship and were wisked away to visit gorgeous Greek towns. The President Hotel you arranged was perfect, and they were very accommodating to arrange to have our rooms side by side. There was an excellent and abundant buffet breakfast in the morning, which was delicious, convenient and at perfect hours for us. The rooms you arranged on the cruise ship were also perfect. It was my children's first cruise and my second (the last one was 22 years ago on a Greek Island tour with my husband). The Ocean Monarch is a beautiful cruise ship and we had large rooms and comfortable beds with air conditioning that we could and did regulate in each room individually. We also had side-by-side rooms on the ship, which was very important to me. The cruise ship had excellent food, a nice pool, beautiful deck and incredibly happy and engaging staff members from all around the globe. Two of our dinner-mates referred to us as their family and never missed dinner with us, no matter what they were doing. The cruise Director and her staff spoke many languages, as did most of the waiters, making it easy to move about and understand what was going on. Our Greek cruise was unusual in that we had a minority of English speaking guests, which was a surprise even to the staff. Yet, we always felt as if we were number one as did each and every other guest on the cruise. The security to get on board and to make sure the correct individuals were getting on and off was well done and important. We even visited the spa on the cruise, trying to do as much as possible while on this cruise. The staff in the spa were helpful and kind. We met the captain's wife and daughter in there and enjoyed speaking with them. We were all a bit jet lagged still when we boarded, but by the last night, the two older children were out on deck enjoying the music, entertainment and new friends. The Gala Show was well done and professional. The tours from the ship were well organized and we had well-informed tour guides. We are only disappointed we did not have more time to tour the city of Athens itself. Oh well, next time. We did take a couple less historic tours, including the Turkish Baths in Kusadasi, which was a real treat. The building was only about 3 years old, but was set up as a Bath House of ancient times would have been, based upon artwork. We did go to the carpet shop, and yes, we did buy a carpet, which they shipped to me and we already received. The Turkish government pays the duties and customs. We really missed not seeing the old Kusadasi I remember from 22 years ago, which was like an old bazaar. Is there still a bazaar area, or is it all designer stores? We also skipped the tour in Patmos, running late on board the ship, and instead opted to go swimming in the clear water along the beach of this island. We could see the bottom of the sea, and ran into Ilias, the driver from our first day and his family at the beach. Then, we went on shopping and found beautiful little paintings for 5 euro. We would have purchased more if we found more. Well as you can see, we truly enjoyed our trip and all the work and planning in advance with your agency made it so easy for us there. All of it was done on the website and through email, and when we arrived, the driver had all the documents we needed for the tours we booked. So, efharisto', as we learned a few Greek words. Thank you. The Cs and the Js want to thank you for your efforts in providing us with a fantastic trip in Greece. The representative from your agency was always prompt, courteous and friendly when he met us. All transfers went very smoothly and the President Hotel accomodations were excellent. The Perla and Louis Cruise Lines were also excellent. We enjoyed the ship and the cruise very much. Your country is indeed beautiful and everyone was extremely friendly. We went home with many good memories. Hopefully we will be able to visit Greece again in the future. Hi, I just wanted to let you know that you did an excellent job with our recent vacation reservations. The cars were on time, the hotel was good and the cruise was great. We all enjoyed our vacation, thanks in part to your great organization. We just returned from Greece. We had a wonderful time. All your arrangements were perfect. The Cruise was Great. Solon, we want to thank you and your company for all the arrangements you made to make our vacation a truly wonderful experience. All of the drivers were on time where we expected them to be and accommodated us as planned. The Orient Express Hotel was very clean and the staff were extremely courteous. The location was close to places we wanted to see by trolley or on foot. Our electronic tickets and reservations were waiting for us at Olympic Air for our on time flight to Athens. The President Hotel in Athens surely deserves its 4 star rating. We enjoyed the piano bar, but hopefully smoking will not be permitted in the future. Our cabin on the Ocean Monarch cruise ship was very nice and spacious. We were not upgraded to TB, but after seeing the TB cabins we were quite pleased that ours was one of the best (TA340). The food and service was excellent and the staff very accommodating. Again, we thank you for your professional advice and arrangements that you made for us. Mr and Mrs R indeed received a Free Cabin Upgrade to the category TA cabin (cabin number: 340) which is MUCH BETTER than the category TB cabins! This a very belated thank you now that I am back home in Australia. We had a very enjoyable short cruise in greece and, with your upgrade, a spacious and yet cozy cabin. The Ocean Monarch proved to be of a nice size with comfortable facilities and enjoyable meals. In fact we preferred the food over Royal Caribbean Lines! The cruise provided a fine opportunity to gain a sense of the Greek Islands. Thank you again for handling the bookings and ensuring a smooth sailing. I would like to say thank you for the wonderful stay in Greece. The cruise was excellent and tranfers were on time. I hope to have opportunity to come back in Greece and congratulations for excellent organization of your travel agency. Our holiday in Greece was as memorable as you promised. I just had to tell you how much we appreciated all the arrangements you made for our tours; the Greek cruise, the pick-ups and drop-offs all went according to schedule and we were able to have a care free vacation. I was also pleased with your advice concerning the hotel choices. Top marks! I am grateful for all you have done. I liked very much Athens and the Greek cruise. The three of us have just returned from our vacation in Greece. We had a wonderful time in Greece and on the Greek cruise. We want to thank you for the way you organized the day tours and the cruise. Everything just fell into place. The Park hotel was great, we enjoyed great dinners there. Your taxi driver did a marvelous job getting us and our luggage to all of the various places we had to go. We had no idea that Greece is such a lovely country. In short, we enjoyed ourselves immensely. Thank you for all of the efforts you made to make our trip a wonderful experience. You can be certain that we will recommend your travel agency to our friends who are considering visiting Greece. Thank you again for making the arrangemrnts for our trip to Greece and the Greek Islands. We had a wonderful time, and we hope to return next year. Your driver was there to pick us up at the St. George Hotel--thank you --the Greek cruise was very nice--thank you for the sheet with the info regarding the excursions--that was very helpful. Thank you again for all your help--we really appreciated all that you did for us--The St. George Hotel was great and so convenient to my daughter's apartment. Thank you again --we had a great time in Athens and on the cruise--all the Greek people that we met were wonderful. i would like to thank you for awonderful trip ,amazing organized arrangments....superior service. everything was great,that im considering to do this trip again with my whole family next year. i thought u deserve to be thanked for everything you have done and my best regard to all employees at your agency. We are home safe and sound after a wonderful vacation in Turkey and Greece. Your planning and suggestions for our ten days in Greece is much appreciated and I thank you and your efficient office staff for all their help. The Park hotel was very nice as was the Astor. The Astor lacked some of the top rate qualities of the Park but made up for it with the great central location and wonderful view of the Acropolis from their top floor. I would be happy to stay at either hotel on a return trip to Athens. Our day trip to Delphi was long but most enjoyable. We found Delphi very interesting and our guide did a good job. We ate at an excellent restaurant in Delphi and had two very good bus rest stops. The Triton was most enjoyable. A nice cruise ship for its size with a friendly crew and very adequate food. It was a fast brush of five islands and Kusadasi. Fortunately we had been to Kusasasi and Ephessos just the week before. We hope someday in the not too distant future to return to the Greek Islands and spend a few weeks. Our favorites would Patmos and Santorini. 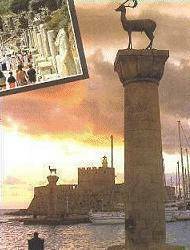 We would also like to visit Hania, Crete where I use to go during my days with the US Army. Maybe you could find the perfect small hotel or villa at these destinations for us! Last but not least out special thanks and appreciation to Llias the taxi driver. Fortunately we had him each time you made the taxi arrangements for us. He was a perfect gentleman, most courteous and very efficient and always on time. Please pass our appreciation on to him. He was the best and helped to make our stay in Athens very enjoyable. Again thank you and all of your folks. The Cs and the Ds have returned to Albuquerque, New Mexico, USA after a sucessful program to Athens and some Greek islands aboard the Triton cruise ship. All was very good for us because of your assistance and careful attention to details. We were especially pleased with Ilias our taxi man, thank you for arranging for him. We will recommend Atlantis Travel Agency to our friends and will contact you for our next journey to Greece. Thank you Sophia for your personal attention to our program, even the Astor Hotel was OK!! My wife and I want to thank you for your assistance with our cruise of the Greek isles as well as staying at The President Hotel. Everything was satisfactory. We particularly appreciated the tip sheet as to what to see on the various stops of the cruise. It was very helpful and allowed us to enjoy the trip even more. Thank you for visiting with us in your office. I regret we were so hurried, but my son-in-law was double parked on the busy square, plus he had our grandchildren in the van. This mail is just to thank you for an excellent Greek cruise and vacation package arranged by your travel agency, wich I enjoyed as well as my family. Is good to know that there is still serious people doing business today because what you promised was exactly what I have got. Please send my Thanks too to the transfer driver who was always on time and a very helpful person. I wanted to thank you and your staff for organizing our cruise and vacation in Greece. The services your agency have provided to us were marked by high professionalism, honesty and supreme knowledge of the travel business. Your expert advise and attention to detail was invaluable. All trips and transfers worked smoothly and without hindrance. The accommodations were just as we had expected. We thoroughly enjoyed the visit to you wonderful country! I will recommend your services to everyone I know. Thank you for the wonderful cruise in Greece. Despina and I had a great time. Sorry it has taken so long for this email, but I would like to thank you and your staff for organising our cruise and holiday in Greece back in April. We had a great time and the kids loved the snow we saw whilst driving to Delphi. The cruise was fantastic even though we only did our own thing at the ports of call. Thank you again and we are certain to let our friends know of Atlantis. I wish to thank you and your staff for the arranagements of our trip to Greece. We highly enjoyed the cruise experience and the vacation. We are back home since Sunday night and Sonny and I want to thank you for helping us in everyway possible with the last minute tickets, checking up reservations with the airlines in the nicest way possible, and also helping us to solve the problem with Sonny's credit card. Not to mention that you and your son were waiting for us even on the holiday! We really appreciate all what you both did for us. I will certainly recommend your Travel Agency to all friends and relatives. Just to let you know that we returned home safe and our trip was a wonderfull experience. We like to thank you and your office staff for the help and advise you have given us. The tour to Delphi was very good and the lunch was excellent as well as the city tour including the Acropolis Museum. After that we visited Syntagma Square and the nearby Plaka. The room at the President Hotel was excellent with a wonderfull view of Athens from our room on the 19th floor. The cruise also was wonderfull with excellent service and we enjoyed all the wonderfull stops in Istanbul and all and the Greek islands along the way and we found the entire trip very intersting and enjoyable. Hello there! I hope everything is going fine for you and your son in BEAUTIFUL Greece. Thank you very much in behalf of my wife and myself for everything you did for us. It was not possible for me to contact you when we returned to Athens, but now -already back at home- I am writing to you to let you know that our cruise was the best. All the personnel was very kind and friendly, and we made several good friends at the ship. Please tell your son that we took his advise, and went to "Veranda" at Mykonos, were we witnessed the most beautiful sunset... And also we were in "Franco's Cafe" in Santorini with the nicest view... In both cases we let the people know that we were there because of your recomendation. We also enjoyed a lot the tour to Efeso in Kusadasi. Receive our regards and, thank you very much once again. Just want to let you know that we had a wonderful time enjoying the hospitality of your countrymen and we were very fortunate to have good weather. Thank you very much for arranging a most memorable trip and cruise in Greece. Thank you for all your help in arranging our unforgettable trip to Greece. We loved the cruise and also the tour you suggested us the day we arrived into Athens. We want to thank you for the arrangements you made for a truly unforgetable experrience in the Greek Islands and Turkey. We very much appreciated your cabin upgrade on the cruise, which made our journey more pleasant. I want to apologize for not calling but honestly we hardly had time for anything, and when we did it was too late at night. We want also to thank you, Sophia and your son for arranging such a wonderful stay in Greece. The cruise was fantastic, we had a very nice time and the Greek islands islands we visited were great. The service at the cruise was very very good, everything included. We made many friends there. Every minute we spent there was worth. We both loved Santorini, it is something really beyond imagination. The hotel was beautiful and everything as you planned it was on time. Thank you again for making our stay an unforgettable one. We sure are going to be the best advertisement for you agency and for your beautiful country. Hope that in the near future we will be able to visit again. Say hello to all that wonderful people in your office and please if you or anyone in your family come here (you never know) get in touch with us. We want to thank you for everything you did to make our recent trip to Greece a wonderful experience. All the arrangements with the tours, cruise, and transfers were exactly as arranged by you and your staff. We were very happy with the cabin on the ship; no lifeboat outside the window! Thank you for all you efforts. We plan on recommending your agency to any of our friends who may plan a trip to Greece. Just to let you know we returned home safely and had a wonderful time. The Greek islands cruise was great and the cabin was the largest and best laid out on the ship. More later with photos. This is just a note to thank you, your son, and the lovely young women in your office for all the help you gave us to organize a wonderful cruise and holiday in Greece. We thoroughly enjoyed our time in Athens; the Park Hotel was very comfortable and convenient (we loved the rooftop pool and cafe), and the excursion to Delphi was fascinating. Then, the cruise on the Aegean 1 was wonderful. The ports were varied and interesting, the crew very helpful and friendly, and the other passengers congenial. We were hoping to find a cross section of Europeans on the ship, and we did. This became part of the educational experience for our children. I will recommend this Greek cruise, and your agency, to all my friends, and will be happy to provide a reference for you should any prospective passenger ask for one. And be sure that when we decide to return to Greece I will ask you to help us again. Subject: Many thanks and hope to see you again! Many thanks to you and your staff for putting together a most wonderful vacation in Greece and the Greek islands. Jim and I were pleased with the plans, and with the care with which you took care of the details. Our transfer driver was always on time and even early. He was very nice also. The side trips were wonderful, as was the cruise. The hotel was in an excellent location. Altogether, it was a magnificent trip, and I can hardly wait to come back. There is so much more to see and to do. When I can come again I will surelly email you, and if anyone asks how we made our plans I will gladly recommend your travel agency. Once again, thank you, and best wishes to you and your family. Just wanted to drop you a note to say how much we enjoyed our vacation in Greece and how much we appreciate all your fine arrangements. We are especially grateful for your suggestion to have a prearranged driver pick us up for all of our transfers. He was friendly and efficient. I would highly recommend that service to anyone with multiple transfers. As you know, we happened to have wonderful weather our entire trip. Sunny and cool. We enjoyed the cruise and loved the stops (the Greek islands and the Turkish port). We walked to the city center at both Mykonos and Rhodes. My son really liked the old city of Rhodes and the two of us walked up the Street of the Knights to the castle at the top of the street. Our favorite stop ended up being Turkey. Perhaps it was the great tour guide we had that took us to the ruins of Ephesus. He was so enthusiastic and fun to listen to. Ephesus is an absolute must to see. It was the only tour from the ship that the three of us took. We had really rough seas the last night from Turkey to Athens and, even though we took something for sea sickness, my son and I did not escape from being sea sick. But then, neither did a lot of other people. The best part of the storm was that it blew the pollution out of Athens and our visit to the Acropolis the next day was fabulous. Sunny and clear. A great view of Athens! As you know, my husband is a large man, but he managed all the walking through ruins except the last day at the acropolis in Athens. He opted out and sat in the sun people watching (his favorite pastime) while my son and I went to the top. He had a wonderful time. We loved our vacation and hope to return again. The cruise only gave us a taste of what there is to see and we hope to talk our relatives into a visit with us next time.